Toddy Flores’ journey to buying and selling sneakers began like most: as a teenager who had financial independence to afford shoes that weren’t picked out by his parents. 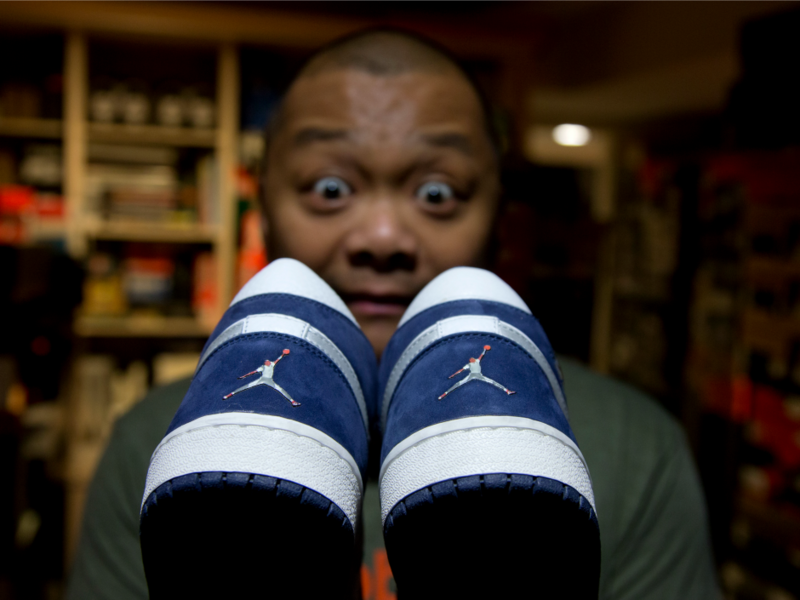 MONTREAL — Toddy Flores’ journey to buying and selling sneakers began like most of his fellow enthusiasts: as a teenager who finally had the financial independence to afford shoes that weren’t picked out by his parents. The 43-year-old Montrealer said he first realized his interest in sneakers went above and beyond the norm while on a week-long trip to Chicago for a basketball tournament in 1989. The all-black Air Jordan 4s were being released in the U.S. that weekend and with his $400 trip budget Flores bought not one but two US$99 pairs knowing the shoes could become rare once they sold out. “Let’s just say I ate a lot of Happy Meals,” he said. Flores soon realized that sneakers could be a passion, but also an investment, using the cash collected through his work as a professional DJ. Although he doesn’t know exactly how much money he’s made over the years, he said it has helped him pay for his wedding, cars and his first condo. “I’m passionate about it, I love them and I see them as pieces of art, but at the same time they have value, and I saw them as something that could be profitable,” he said. The sneaker reselling market has grown from a niche interest into an industry worth an estimated US$1.2 billion per year in the U.S. alone, fuelled by celebrity culture and made more accessible through the Internet and social media. Although the industry is still heavily focused on young people, it has drifted to the mainstream as consumers have aged and started making more money. Sneakers produced in limited runs have now become highly coveted luxury items that can be sold for many times their retail value on the secondary market. To get an idea of the resale value, the right model of Yeezys — the Kanye West-Adidas collaboration — can retail for $300 and resell for more than $1,000. Flores once owned close to 1,400 pairs of sneakers, but decided last year it might be time to downsize his collection when had to make two trips with the moving van for his sneakers alone after he bought a new house. He also doesn’t have as much time to devote to his passion, given that he’s a DJ, owns a restaurant and wants to spend time with his family. He recently sold about 400 pairs and used the profit to afford his dream car: a Porsche 911 convertible. But with about 900 boxes of sneakers still crowding out the living space in his finished basement, he said he would be happy to sell most of them and just hold onto the ones he really loves — a modest 150 pairs. “It’s a lot of dedication and time that you need to do it and hopefully sell enough or trade enough to make it worthwhile,” he said. How resellers get their hands on sneakers varies from person to person. Flores said he’s developed a network of collectors and store managers during the past 25 years to help get the shoes he’s looking for. Those without Flores’ connection have to find other ways to get their hands on the rarest sneakers, including camping out in front of stores for hours, sometimes days ahead of a release. Others, such as University of Ottawa student Elliott Klein, make extensive use of the Internet. He said anyone who treats it as a business can’t just rely on online retail checkouts to get a pair of sneakers that are being sought after by thousands of people — both buyers and resellers. Competition is so intense that Klein uses computer programs called bots to automatically select the size and process an order in 10 to 20 seconds, shaving off just a little bit of time from the 30 seconds it might take for a human to do it. Klein said serious resellers now rent temporary servers that have high Internet speeds to run the bots, and have access to multiple credit cards, IP addresses and physical addresses to ship, because some companies cancel orders if they notice multiple pairs are being sent to the same person. There are also regular conventions in most major North American cities where collectors can display their shoes to sell or trade. Flores said he’ll be attending one called Sneak Peak MTL early next year, and adds that the social and community aspect of these events is just as important as the profit. Selling on the Internet — eBay is an obvious way as it’s an online auction — creates problems when it comes to authentication. Buyers are left on their own to figure out who the sellers are and their reputations. People who feel they have been scammed are left to resolve conflicts with PayPal on their own. For example, a judge in October ordered eBay to pay two Montreal brothers more than $86,000 after it took down their advertisement for a pair of highly prized Nike sneakers because the online auction giant claimed the first-time seller’s listing looked like a fake. In the past few years, there has been a migration away from eBay to social media sites such as Facebook where online communities can self-police through reputations gained by buyers and sellers, though this doesn’t solve the problem of authenticating products. Former IBM Corp. consultant Josh Luber believes he has come up with solution. In 2010, he combined his loves for sneakers and data analysis to create Campless, a company that collects, analyzes and publishes data and derived insight related to the industry. And in February 2016, he and Cleveland Cavaliers owner Dan Gilbert launched StockX, which functions like a stock market for sneakers.